Since its foundation, MAGI has been concerned with projects of international cooperation. Its mission includes helping poor countries to look after their patients. Training is the first step. To implement this conviction MAGI decided to invest a large part of its profits in cooperation projects. MAGI has designed various projects of international cooperation in developing countries through initiatives based on the will to help patients meet the challenge imposed by illness and the unknown. Our belief is based on solidarity and hope that extend beyond our borders, because if we believe that all people are equal, irrespective of country, we must also believe that the cry of a patient close to us counts as much as that of a patient in a distant country. Although our effort is like a drop in the ocean, MAGI intends to treat genetic diseases of patients in poor countries in the same way as genetic diseases of patients in rich countries. This project began in 2014 with the opening of the new centre for blood-donors and research into rare genetic diseases. The centre was set up by a group of doctors and donors to improve the chronic shortage of blood and the quality and safety of donation, and to reduce the practice of selling blood in Albania. The president of the Albanian blood donors’ association (the local partner) underlined the association’s medical, social, civil and cultural commitment with its staff and through local collaboration. The idea was to use preventive medicine and genetic analysis to diagnose rare diseases. In the first phase, the doctors and biologists of MAGI will conduct the activity, with the idea of training new local personnel who can eventually render the centre autonomous. MAGI is also involved in training and assistance in the field of genetic diagnosis. In 2015, our new spin-off was officially inaugurated in Krasnoyarsk, Siberia. The laboratory was constructed and donated to the local university to permit diagnostic tests for genetic diseases not yet studied in that area. Each year MAGI offers various study grants to new medical graduates from the University of Krasnoyarsk wishing to train in our laboratories in Italy. 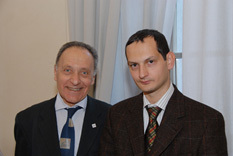 Thanks to the collaboration of Prof. Lucio Luzzatto, director of the Istituto Toscano Tumori (ITT), MAGI offers this prestigious institute a number of study grants to enable young doctors from the University Hospital of Ibada, Nigeria, to come to Florence and train in new techniques for studying blood malignancies in Africa, today a health emergency. The success of this initiative prompted MAGI, with the collaboration of Prof. Luzzatto, to create a diagnostic unit for genetic diseases including thalassemia and glucose 6-phosphate dehydrogenase deficiency, closely correlated with malaria, at the University Hospital in Dar es Salaam, Tanzania. The unit, with more than 300 beds, serves a population of about a million in the surrounding area. The project includes a laboratory equipped with molecular biology instruments (PCR) to test for the above diseases.